"...he called the Wichita airport and chartered a plane and a pilot. G.A. McDonald flew them in the Romance, the cabin plane that Charles Lindbergh used when he courted and married Ann Morrow in Mexico City... The Brinkleys loved the speed and safety so much that they promised to buy a plane if McDonald would be their pilot. 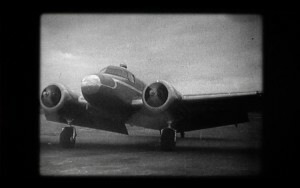 They purchased a Travel-Aire (later Beech Aircraft).... John later bought a ten-passenger Lockheed Electra, painted blue and gold" (Lee, 115-116). "Darting about the state in his snazzy blue-and-gold plane – previous owner Charles Lindbergh – Brinkley drew the largest crowds any Kansas Politician had ever seen" (Brock, 156). "The Romancer" as name of plane: "The Year The Election Was Stolen," James Reardon, The Kansas City Star, Kansas City, Mo., Nov. 7, 1982. Actually, this was told to me by Johnny Brinkley during my interviews with him. Francis Schruben tried hard to verify this but could not. I doubt that it is accurate.